It’s harder to find a more exciting hobby than flying. Regardless of whether you’re taking your first flight or going up for the millionth time, nothing beats the rush of watching the world shrink beneath you as you climb into the clouds. Take it from me: For years, I’ve flown fixed-wing aircraft, and I wouldn’t trade my time in the skies for anything. But before you hop in the pilot’s seat, you’ll first need to earn your pilot’s license. This process isn’t too complicated, but it does require patience, focus, and dedication. To qualify for a pilot’s license, you must be at least 17 years old, and you must also be able to speak, read, and write perfectly in English (English, interestingly, is the international language pilots and air traffic controllers around the world use to communicate with each other). There is also a medical component in order to be qualify for your pilot’s license that requires you to be in good health and pass a physical examination. This is one of the easier items to check off the list. You can obtain this by either submitting an application to a Federal Aviation Administration (FAA) Flight Standards District Office or to an FAA examiner. Conveniently, when you receive your aviation medical certificate, the document you receive at that time doubles as both a student pilot certificate as well as a confirmation of medical fitness, so you can handle two birds with one stone then. The Aircraft Owners and Pilots Association (AOPA) website includes a database of licensed flight schools if you need to find one. Make sure that you’re comfortable with both the school and the instructor before committing. 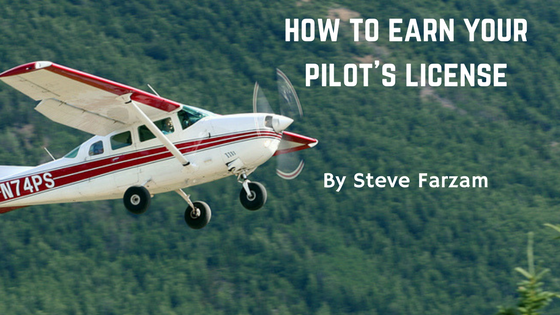 This stage of the process is where you’ll actually fly; you’ll also need to pay for this time, however, and flight school can cost around $5,000 throughout the learning and licensing process depending on your location. I went to a very affordable flight school at Brown Field in San Diego, California. Note that some flight schools will require you to take the FAA written exam before they let you into the cockpit, but either way, you’ll need to pass it to earn your pilot’s license. It consists of 60 multiple choice questions, and by the time the two-and-a-half hour test period is over, you need to answer at least 70% correctly in order to make the grade. The test comes with a $70 fee. Administered by an FAA examiner, the checkride is the last obstacle standing between you and your pilot’s license. It typically lasts between one and two hours with the examiner joining you as a passenger and asking you to perform certain maneuvers and quizzing you on practical test standards (PTS). If you pass—congratulations! You’ll have to file some paperwork with the examiner, but you’ll have earned your pilot’s license.